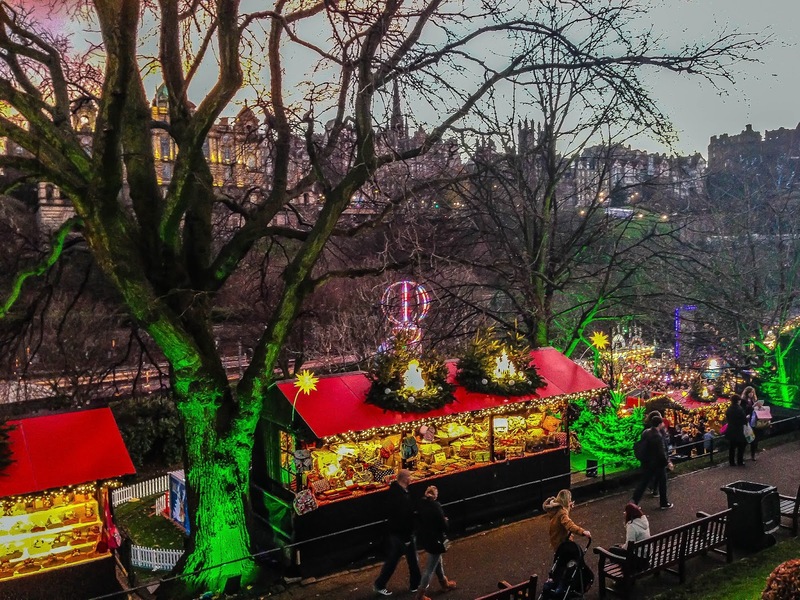 Over the past twenty years, Edinburgh has emerged as a major player when it comes to organising and hosting a thoroughly festive Christmas experience. Every time I go, it seems to be bigger, brighter and busier. It's already a stunning city, but the added glitz of the darker days with the sparkling lights from the Ferris wheels and the smell of warmed spices make it just that little bit more special than usual. Even for me...and I don't even like Christmas stuff. 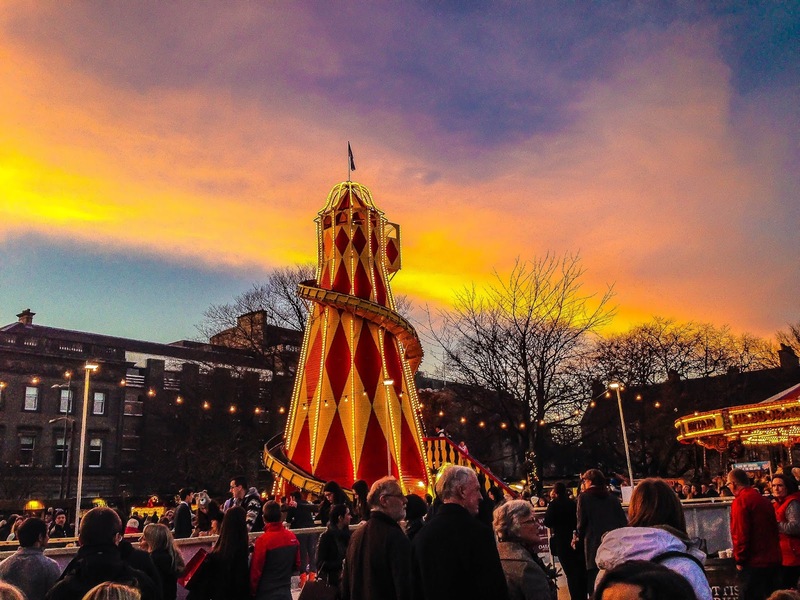 For 2015, the festivities run from Nov 20th until Jan 4th and include a Children's, European Christmas and Scottish Markets, along with ice skating (in various venues), giant Ferris wheel, Santa Land, shows, games, music, and the most important thing: mulled wine. Well, you can't really be taken seriously without it, can you? Located just behind the main shopping venue of Prince Street in the beautiful St. Andrews Square, the Scottish market offers you a taste of, well...Scotland. Including arts and crafts, food (and no, there are no deep fried mars bars because we don't really eat them), our wonderfully produced gins, whiskies and beers, and our world famous seafood, meats and a massive range of other goodies. 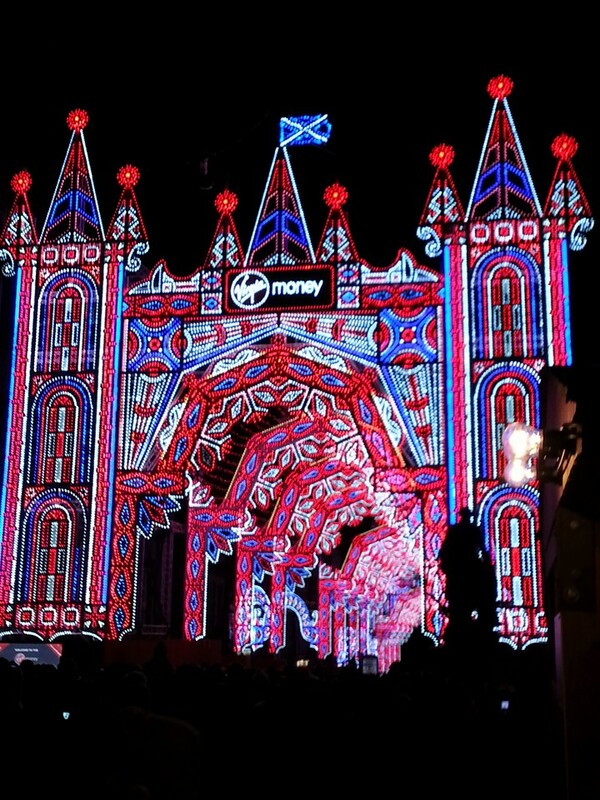 This is my favourite part of Edinburgh's Christmas for no other reason than that it makes me feel like I'm somewhere else. The only other place I've spent Christmas outside of Scotland is in Las Vegas, so I've no idea why I feel like this, but I do. This gorgeous little market area covers the area at the east of Princes Street Gardens towards the Scott Monument and takes in the delights of many European Christmas traditions. It can be pricey (as with many other things in the capital city), but it does make for a fantastic experience. Edinburgh's Christmas is seriously massive and there's no end of things to do and drink. There's also a crazy big selection of rides to choose from. 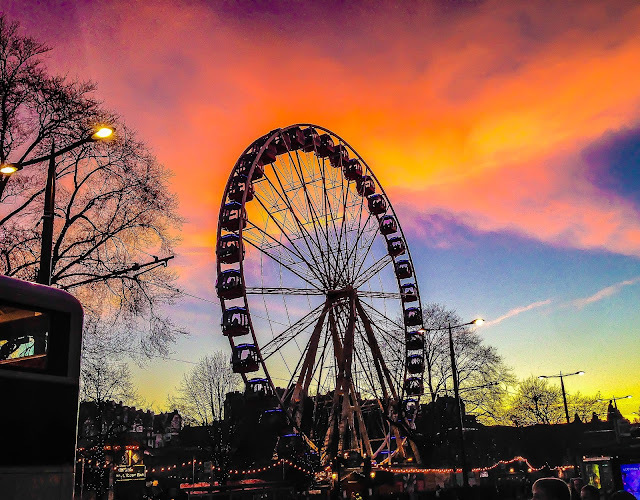 The main event is the Ferris wheel which, when you see going up lets you know that Christmas is on the way. It's like the Scottish equivalent of the Coca Cola truck. But better. If you're too chicken for the big wheel, you probably shouldn't try the star flyer and you should almost certainly steer clear of attempting the ice wall. 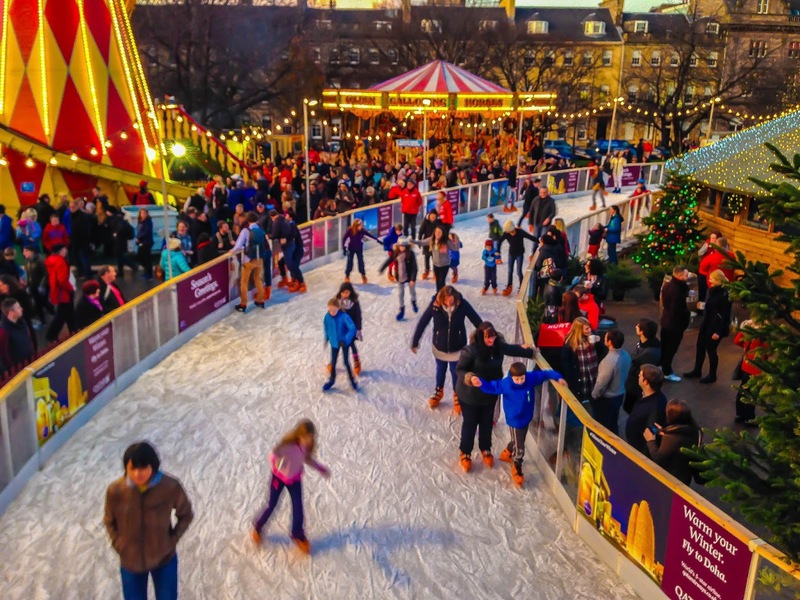 Stick to the carousels, some gentle skating, or some very relaxing beer sipping. New for 2015 is the Virgin Money Street of Light, which is based in the city's beautiful Old Town. Although you will need a ticket to enter, they are free of charge. More than 60,000 lights and 26 arches have been installed up and down the streets and has transformed the area into a kind of Fremont Street Experience. The event runs until Christmas Eve and runs twice a night for twenty joyful minutes. the national grid must be bursting at the seams. Not technically part of the official Christmas festival stuff, The Dome on George Street is located just a minute's walk from St Andrews' Square ice rink and Scottish Markets, and has become a bit of Christmas attraction in its own right because of the incredibly well designed and rather fabulous yuletide decorations. 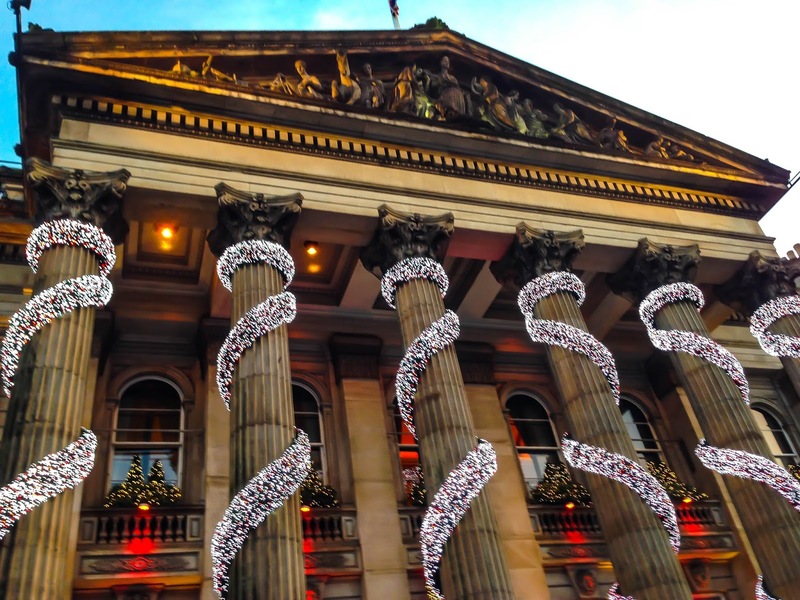 The outside of the Greco-Roman building is already stunning and the lights looped around the pillars at this time of year make it even more special. However, don't just settle for these - you MUST go inside and have a look around. Chances are, you might not be able to get a seat at the bar, but it's worth annoying those who have in order to look at the tree and the beautiful lights within. It's my very favourite thing. lights and drinks....what a combination. Trains from all over run pretty much constantly into the city centre (no, honestly) to both Waverley and Haymarket stations and they are, helpfully, located at pretty much either end of all the main events. There are also frequent trams, which will bring you in from the airport, the Gyle, Hermiston, and various other stops along the way. Edinburgh is a very walker friendly city anyway, so it's really easy to get around on your feet. 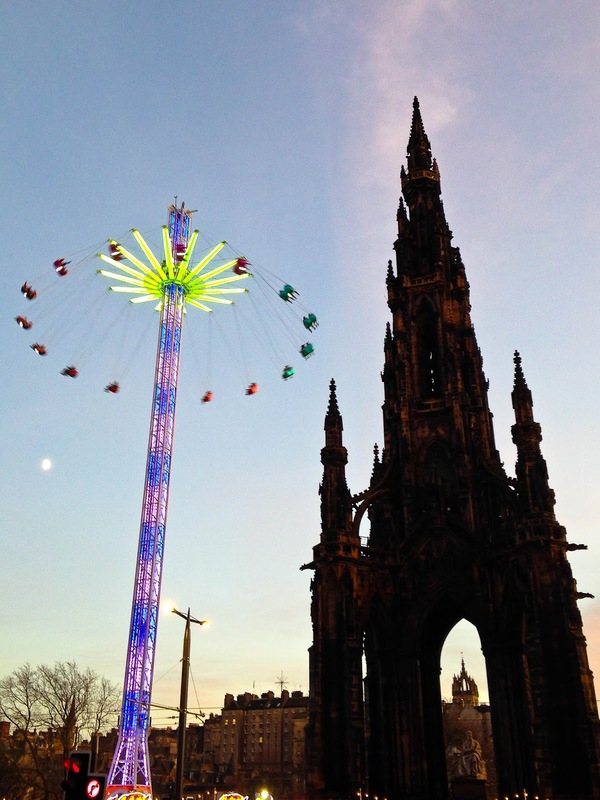 It's also totally worth walking around to make sure you get to see all the everyday Edinburgh attractions that are sneakily dotted around in between all the Christmas merriment.